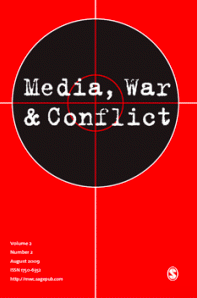 I’ve had a chapter accepted for the Handbook on Violence in Film and Media, edited by Steve Choe and Lina Aboujieb for Palgrave Macmillan. This will be the second paper from my PhD project “The Gulf War Aesthetic? Certain Tendencies in Image, Sound and the Construction of Space in The Hurt Locker”, following the publication of an interview with Kathryn Bigelow and Mark Boal published in Kathryn Bigelow: Interviews for the University of Mississippi Press. The paper asserts that the adoption of innovative sound design and composition practice within the production in The Hurt Locker (Bigelow, 2009) are, in part, a response to representing the compromised nature of the Iraq War complicated by unknowability and complexity – what Joshua Clover has described as the “unnarratability” (2009: 9) of asymmetrical warfare; new modes of conflict that can be distinguished from the “old wars” of the 20th Century in terms of their politics, use of technology and combat tactics (Freedman and Barnett, 2003; Kaldor 2012).